This was created quite a while ago for a school project. One of our assignments was to produce a video for the school’s annual film festival, either individually or as a group. 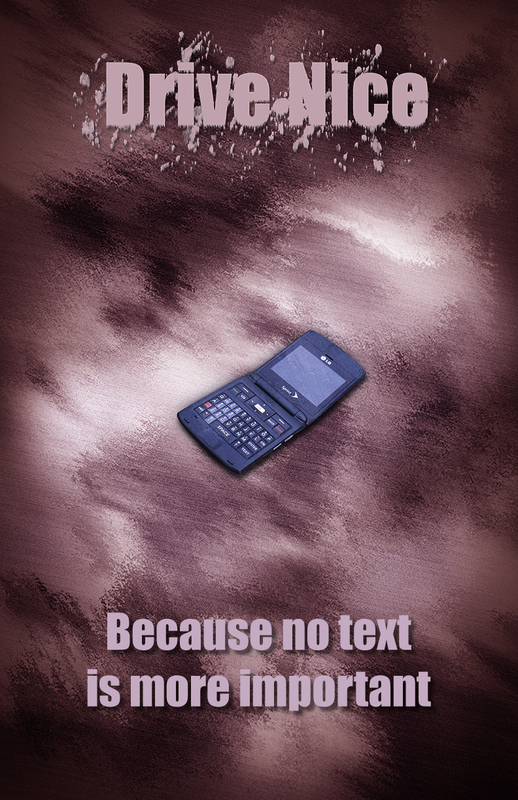 My group decided to enter a PSA we had created earlier as an entry for a local contest about the dangers of driving while texting. The next assignment was to create individual posters for the video we submitted. This is what I designed. The background was created using the grunge brushes I created along with a few filters. The title text was edited by using splatter brushes and the wind filter. The phone is my phone, taken by a classmate. The whole thing was put together using Indesign, though for web use, I recreated the image in Photoshop.